First of all just do this for me, open your Excel workbook and try to type RANKIF. You will be wondered that there is no function in Excel for conditional ranking. Yes, there is no one. Now, just think this way, have you ever faced a situation where you have to rank values by using some specific criteria? And if yes, then how you solved that problem, because you know there is no RANKIF function in Excel. Let me tell you something, whenever you want to create a conditional ranking based on a specific criterion or category wise ranking, the best way is to use SUMPRODUCT. Yes, you get it right, it’s SUMPRODUCT. I’m in love with this function from the last couple of years and today, in this post I will show you a simple way to rank values with a condition by using SUMPRODUCT. A simple way, no big deal. And, this is a kind of technique which can drive you from beginner to advanced Excel user. Here in this example, we have a list of students with their score in different subjects. You can download this sample file from here to follow along. First of all, add a new column at the end of the table and name it “Subject Wise Rank”. Now in the D4 cell, enter this formula =SUMPRODUCT((–(C2=$C$2:$C$121)),(–(B2<$B$2:$B$121)))+1 and hit enter. After that, apply that formula to the end of the column, up to the last cell. Congratulations, you have added subject wise ranks for the students, and do you believe you took a few seconds. Isn’t it simple and effective? But, the important part is to understand that how this formula works. And believe me, you’ll be surprised when you get to know that you have done a magic here with this function. To understand this we need to break this formula into three parts. And, please remember SUMPRODUCT is a function which can take arrays even when you haven’t applied a formula as an array. In the first part, you have used (–(C2=$C$2:$C$121)) to compare a subject name with the entire range. And, it will return an array in which all those values will be true which are matched with the subject name “Finance”. To check, just edit your formulas in cell D4, select only first part of the formula and press F9. It will show all the values of the array. Here all the values which are matched with the subject name from the cell D4 are TRUE and the others are FALSE. So the point is, it has returned a TRUE in the entire array where the subject name is matched. And in the end, you have to use the double minus sign to convert TRUE and FALSE into 1 and 0. Result from this part of the formula: We have a 1 where the subject is matched and 0 where the subject is not matched. In the second part, you have used (--(B2<$B$2:$B$121)) to check other student's score which is greater than the Tameka's score. And, it returns an array in which all the values are TRUE where marks are greater than Tameka. To check, just edit your formulas in cell D4, select only second part of the formula and press F9. It will show all the values of the array. Here all the values which are greater than "24" are TRUE and others are FALSE. So the point is, it has returned a TRUE in the entire array where the scores are greater than "24". And in the end, you have to use the double minus sign to convert TRUE and FALSE into 1 and 0. Now, it will look like this. Result from this part of the formula: We have a 1 where the score it greater and 0 score where the score is equal or lower than. Now take a deep breath and relax. Slow down your mind and think like this. At this point, we have two different arrays. In the first array, you have 1 for all values where the subject is matched and 0 if not matched. In the second array, you have 1 for all the values where the score of the students are greater and 0 if equal or lower. Now, when SUMPRODUCT multiplies these two arrays you will get 1 only for those students whose subject is matched and the score is greater than Tameka. Just look at this, there are 9 other students with greater than marks from Tameka in Finance. At this point, you know that a total of 9 students is there whose marks are greater than Tameka. So, if 9 students are there then Tameka should be on 10th rank. That's why you need to add 1 at the end of the formula. 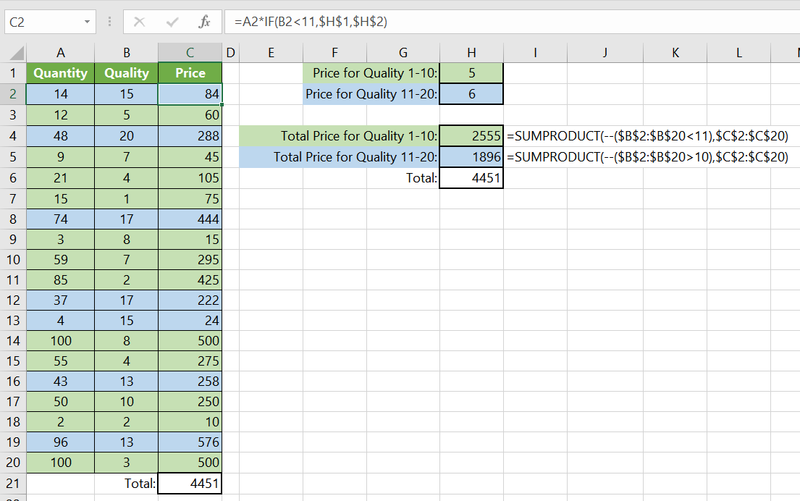 If you ask me, I believe SUMPRODUCT is one of the most powerful functions in Excel library and the method we have used above is simple and effective. With SUMPRODUCT, you don’t need to write long nesting conditional formulas. You just need this magic trick to add conditional ranks. I hope this tip will help you in your work and now, tell me one thing. Do you know any other method to creating RANKIF? Thank you for sharing this formula! Can you maybe advice how to adjust formula if some of the scores are the same under group finance (two students lets say received the same grade within certain group)? With current formula the same score within the same group is given the same score instead of ranking them. I have been using a “copy and paste” version of SUMPRODUCT to do conditional ranking, and while it works fine, I’ve been terrified about having to change it because I didn’t really know how it worked! I had been unable to find a full explanation of exactly what it was doing … until now! Thanks for taking the time to set this out. I finally understand it enough to be able to modify it for different scenarios if required. We can also use SUMPRODUCT(($C$2:$C$121=C2)*(B2<$B$2:$B$121))+1. This will help is doing away with the need of double minus sign. For sharing, I solve this problem with a very similar approach using COUNTIFs. Have a look, hope you like it. thanks for the reply. I wasn’t clear enough. The “runs” are all in one column. See screenshot as an example..
Hi. I have a similar problem.I want to capture price of a product from price list, wherein that product has different level of quality(Ex.- 5 or 3) different range of price has been given in front of each product in price list( price = 5 for quality range(1-10) & Price =6 for quality (10-20) for the same product. the data is huge. i just want to create a single formula for this. Brilliant post. I have a similar problem that I can’t solve, maybe you can help. I have a column that has many runs (1,2,3,4 and 1,2,3 and 1,2,3,4,5,6, Etc.) in it. I want to rank the runs from the longest to the shortest and can’t see how to do it. hi Puneet! the best thing about you that you address you solve problem based on practical scenerios. This why this site is the best for excel learners. One thing I dream about a trick or combination of formula to find the 2nd value / latest value using vlookup rather than getting the first value. Im sure you have solution for this. I didn’t get the logic for the first time but when I reread it, I got the whole tricks. Thanks Puneet.